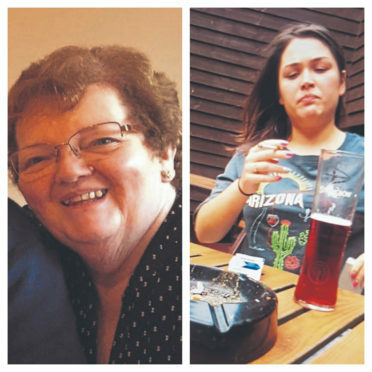 Dorothy Cruickshank (left) died after the crash caused by 19-year-old Kathryn Forman, who herself sustained serious injuries. The family of a pensioner killed in a horrific smash last night claimed they had been let down by the justice system after the teenage driver responsible avoided detention. Kathryn Forman was accused of “showing no hint of human decency” in the months following the two-car crash near the notorious Toll of Birness, just north of Ellon, last April. The 19-year-old and five others were taken to hospital with serious injuries. Among them was Dorothy Cruickshank, 66, who suffered a broken pelvis, legs and ribs. She died from multi-organ failure 10 days later. Forman previously admitted a charge of death by careless driving, and returned to Aberdeen Sheriff Court for sentencing yesterday. 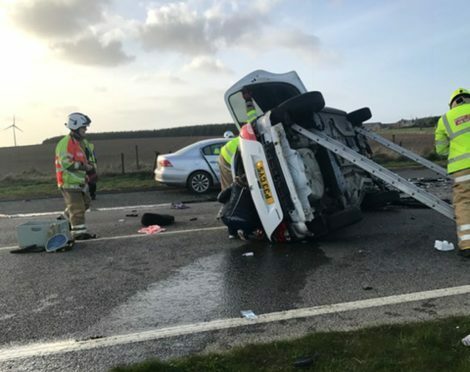 The social work student caused the crash while flicking a cigarette from the window of the Peugeot 207 as she drove along the A90 Aberdeen to Peterhead road with three friends. The “short distraction” caused the car to mount the kerb and swerve out of control, smashing into an oncoming Volkswagen Passat being driven by Mrs Cruickshank’s husband James. The force of the impact propelled the vehicle into a lay-by, trapping the Hatton couple inside. Forman’s solicitor, Gavin Anderson, opened his remarks yesterday by apologising on behalf of Forman. He said the teenager had been unable to speak out before that point as she had been advised against discussing the crash with anyone but her legal team. Mr Anderson said: “She has not be able to apologise personally to those involved because such a discussion might encroach into the case. After hearing the arguments in court, Sheriff Brown said: “Nothing which I can say or do can lessen the grief felt by Mrs Cruickshank’s husband, family and friends. He ordered Forman, of Iona Avenue in Peterhead, to undertake 300 hours of unpaid work over the next year. She was also placed on a one-year supervision order and has been banned from driving for three years. However relatives of Mrs Cruickshank felt the punishment was not severe enough. In a statement, they said: “Our mum was tragically taken from us due to Kathryn Forman’s reckless driving. “The justice system has failed us. “She has shown no sign of remorse or hint of human decency since the crash which is incomprehensible. “We ask that people please drive responsibly as the devastation caused is unbearable for those left behind. One of the teenage victims of the crash, Kyle Hutton, who was in Forman’s car, described the verdict as “disgusting”. The keen boxer was unable to walk properly for five months afterwards and is awaiting a hip replacement to fully correct the injuries he sustained. His mum Vicky said: “I think it is shocking. I feel bad for the Cruickshanks.